A Pokémon communication game that requires the Voice Recognition Unit to play. A wild Pikachu has appeared near your home. Professor Oak asks you to befriend the Pikachu, play with it and see if you can tame it with nothing but voice commands. Hold down the Z Button to record, then release Z to send your words to Pikachu. If he recognises your words, he will carry out your commands. 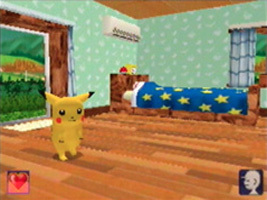 After a few game days you will be good friends with Pikachu and can play games with him in the field. Babysit a group of Caterpie, attend the Bulbasaur petal festival, go fishing, and more.